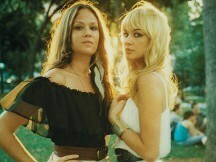 The Pierces' singer Allison Pierce says her ex-boyfriend won't have heard her record about him. I Put Your Records On deals with breaking up with a musician, and listening to his records to find out if he's as upset as she is. "I don't think he's heard it but he'd know it was about him," Allison said. The track is the closing song on You & I, sister duo Allison and Catherine's current fourth album. The siblings, who will be performing at the V Festival this summer, are from the US, but have lived in London since February. Catherine said: "We love it here and the city has made it into a few new songs I've written. My boyfriend is from Leeds, so there's one about meeting someone in London." She added: "It makes a lot of sense to be here. We don't have a deal in the US at the moment, although we are talking to some labels at the moment."